The 2.2-mile long trail winds around the base of the towers which are internationally recognized features including Titan, the largest freestanding sandstone spire in the world. Location: 22 miles east of Moab, UT, At BLM’s Fisher Towers Recreation Site, off Scenic Byway 128, 21 miles northeast of Moab. The Fisher Towers Hiking Trail is a popular trail (16,000 visits in 2006) which provides access for one a unique scenic geology hike in North America. The 2.2-mile long trail is used by people from all over the world. It winds around the base of the towers which are internationally recognized features. The tallest sandstone monolith, the Titan, is the largest freestanding sandstone spire in the world. The Titan towers 900 feet above hikers on the hiking trail below. 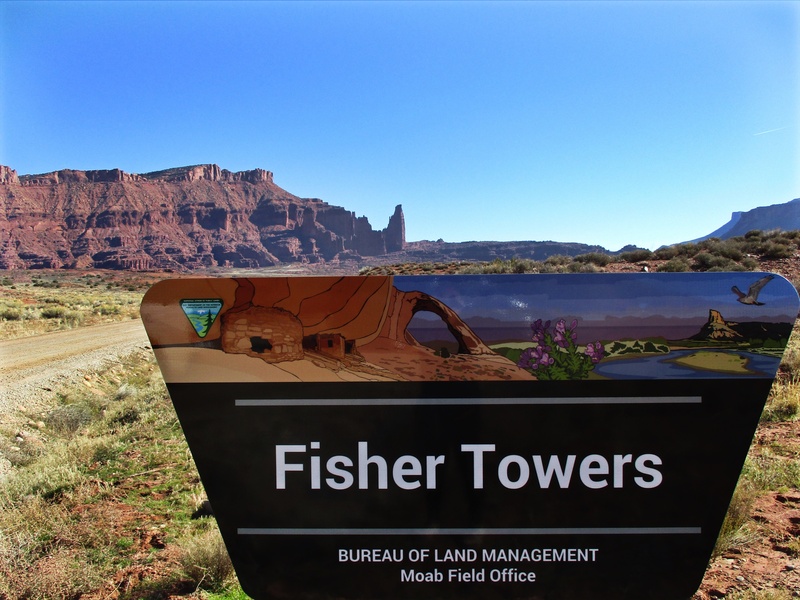 Fisher Towers is an outstanding natural resource and an iconic symbol of southern Utah. 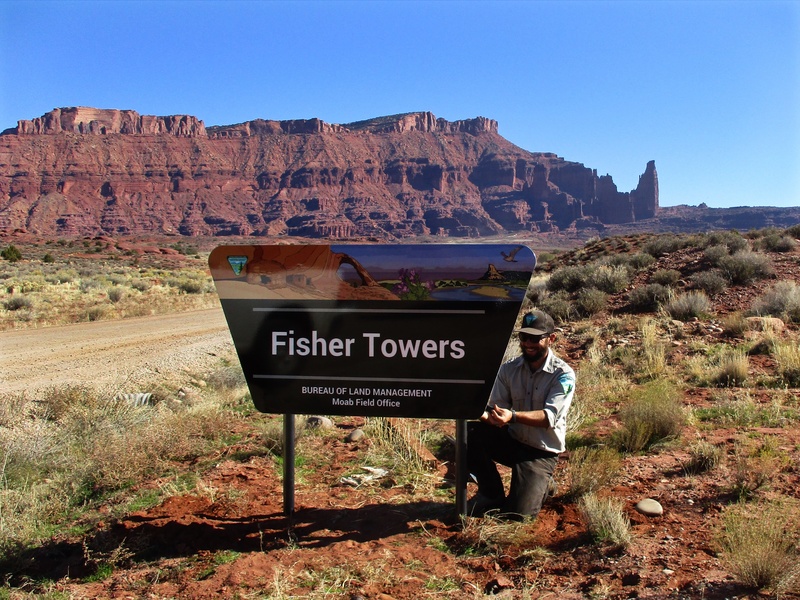 Fisher Towers Trail allows the public to walk in among the towers and to access their beauty. The trail provides a unique way for the public to experience the forces of geology that are characteristic of the Colorado Plateau. Goblins along the trail. Photo by Stuart Macdonald. Red rocks wall with hiker for scale. Photo by Stuart Macdonald. Fisher Towers camp. Photo by Ida Koric. 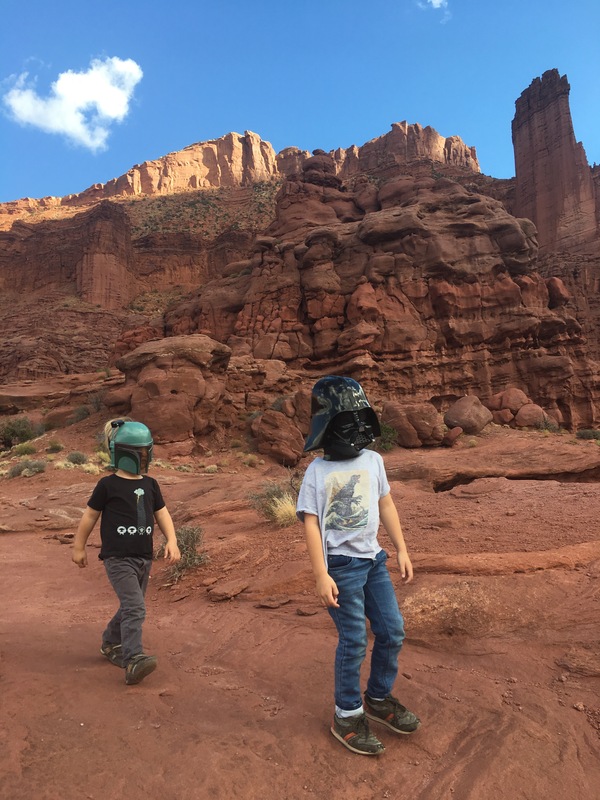 Halloween at Fisher Towers. Photo by Ashli Murdock. 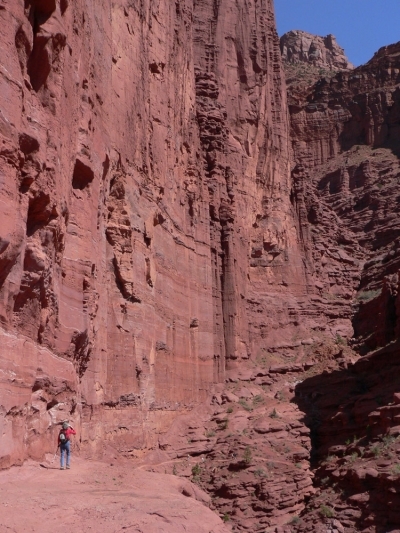 A climber savors the moment at Fisher Towers. Photo by Valerie A. Russo. 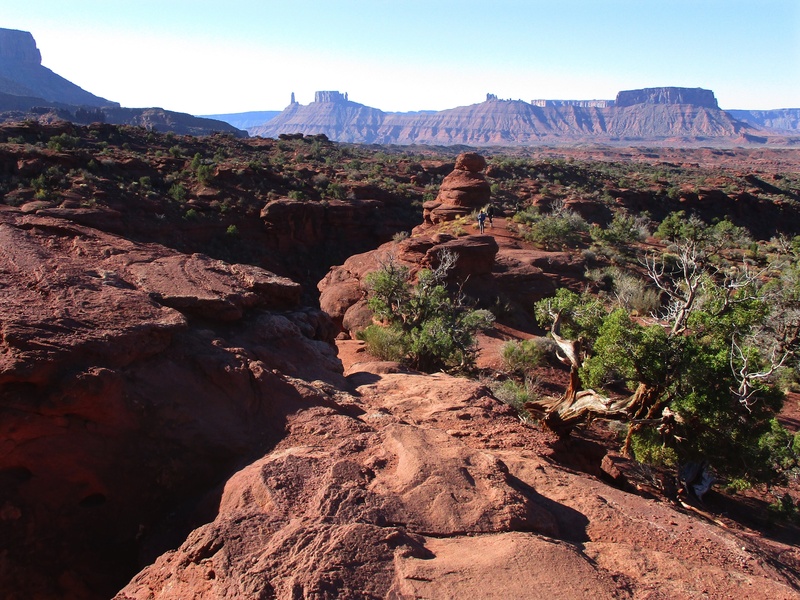 View from the Fisher Towers trail. Photo by Valerie A. Russo. BLM ranger installs a new sign. Photo by Valerie A. Russo. New sign. Photo by Valerie A. Russo. 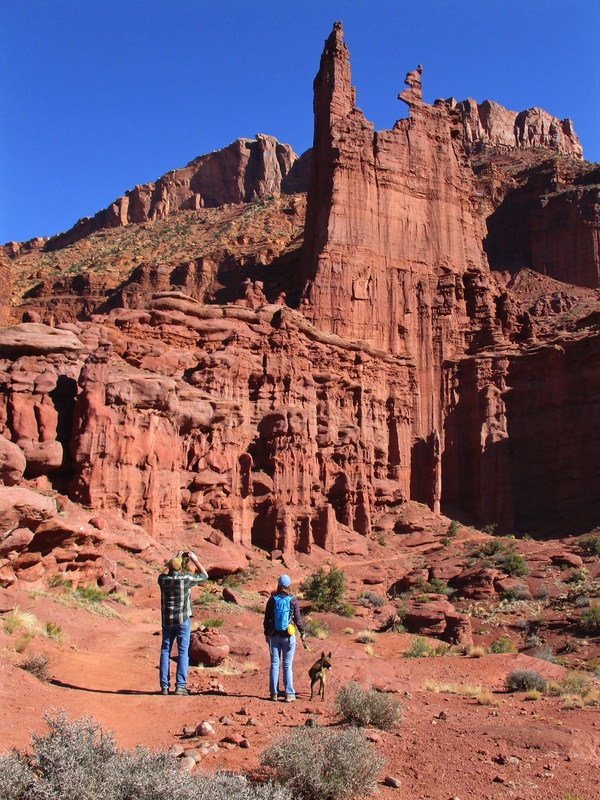 Hikers and leashed dog on the Fisher Towers trail. Photo by Valerie A. Russo. Hold on -- we need a cable! 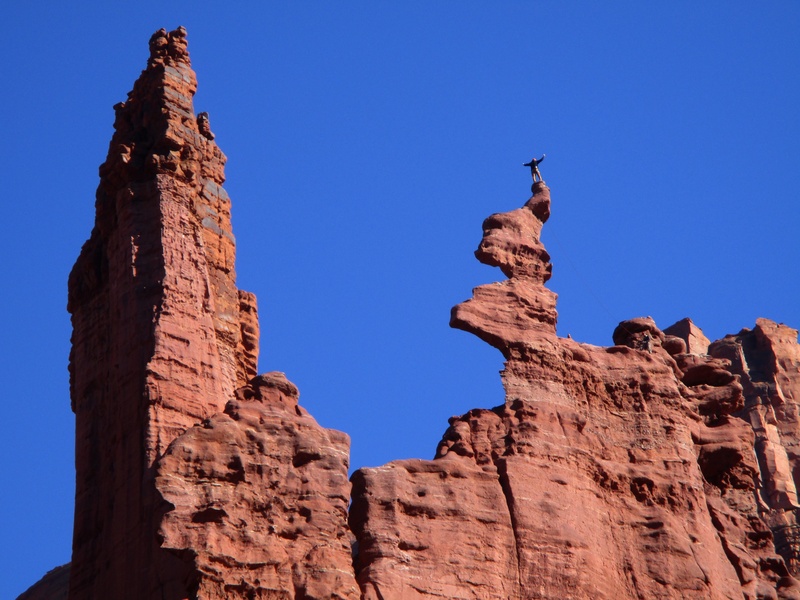 From the Fisher Towers trail, hikers can watch climbers make their way to the top of their chosen sandstone tower and can enjoy views of distinctive buttes in the distance (Castle Rock, the Monastery and the Monsignor). 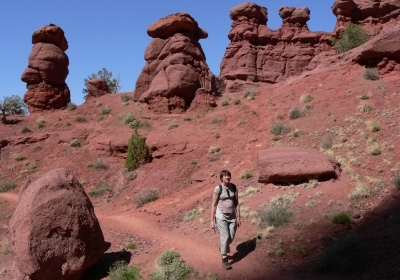 But there's one section of slickrock on the trail that's too steep to climb safely without a secure cable to hold onto. 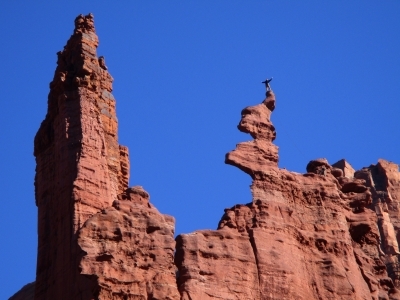 Of course, athletic climbers can bound up the slickrock like mountain goats, but casual hikers could use some help. This is one of the most amazing trails I've hiked. 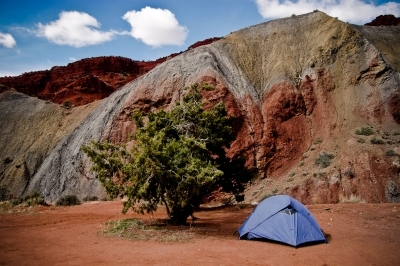 Location is right off the river highway east of Moab so it's convenient if you're coming or going in the Colorado direction. The scale of the rocks is vast but you're right in the middle of them, so it's more intimate than the national monuments and of course not so crowded. Trail is well developed and easy to follow.